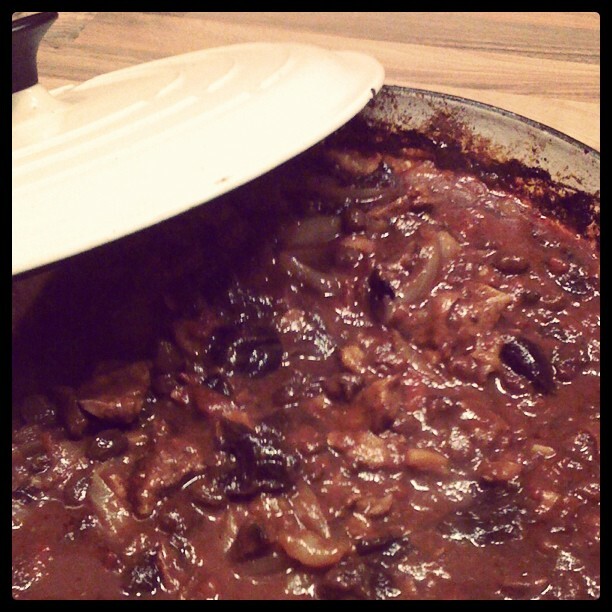 This lamb tagine is a lovely dish and not that hard to make! I made it for a dinner party and the timings work out well because you can cook it all the night before or morning of. You can find it in The Guardians top 10 stews. Preheat the oven to 160C, season the lamb with salt and pepper and set aside. Melt the butter in a large casserole dish and sweat the onions for about 5 mins with the saffron threads. Remove from the heat then stir in the fresh ginger, garlic and spices. Add the raisins and prunes. 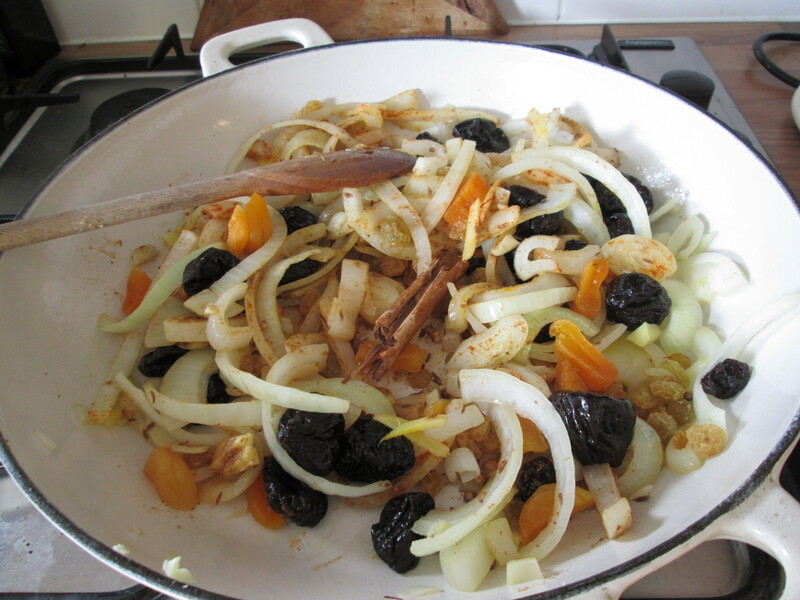 Pop in the lamb and try to cover as much of it as possible with the onion and spice mix. Add the chicken stock and chopped tomatoes and cover with foil and a lid and cook for 2 hours or until the meat is tender. You can stop at this point if you are prepping for dinner and do the rest when your guests arrive. Spoon off any fat you can from the surface then raise the heat to 200C, remove the lid and foil and return to the oven for another 15 minutes for the lamb to brown a bit. Then remove from the oven and let it sit for 10 minutes or so. You can reduce the sauce if it seems a bit thin and it’s ready to serve. Just before you serve, melt a little butter in a frying pan and fry the almonds, being careful that they don’t burn. When they have browned, dry them with a paper towel and sprinkle with a pinch of sugar and salt. This is a great addition to sprinkle over the tagine. Serve with couscous and/or pitta bread to soak up the juices and enjoy! Posted in Recipes and tagged dinner, dried fruit, food, lamb, nutrition, recipe, spices, tagine.